Could curing heart failure be as simple as administering a one-time outpatient infusion of a gene therapy product? In a study published in JAMA Cardiology, researchers presented promising results of a Phase II trial showing that gene transfer treatment of patients with heart failure and reduced ejection fraction was safe and successful in over 90% of patients. In an interview, Jack Reich, PhD, co-founder and CEO of Renova Therapeutics in San Diego, CA, which plans to market the gene product as “RT-100,” said the patients were treated with an infusion of AC6, a protein found in cardiac muscle cells. In most heart failure patients this protein is down-regulated in the heart, leaving the organ contracting weakly. 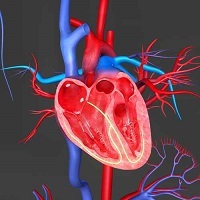 In the trial, an inactivated adenovirus vector encoding human adenylyl cyclase type 6 (Ad5.hAC6) was infused directly into the arteries to the heart during cardiac catheterization. “Forty percent of the heart cells took it up like a sponge,” Reich said. The AC6 gene transfer “safely increased LV function beyond optimal heart failure therapy through a single administration,” the team wrote.